From the bestselling author of Goodnight, Goodnight, Construction Site, Sherri Duskey Rinker, and the award-winning creator of Me . 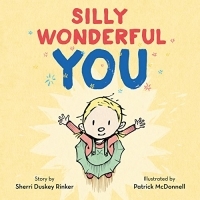 . . Jane and The Skunk, Patrick McDonnell, comes this funny and tender love letter from a parent to her child. Before YOU came along, so many things were different! But now there's a giggly baby, a house full of adventures and toys, a million little surprises. . . . And so much love. I seriously loved this book, possibly more than the kids did. I think that's because it depicts exactly what I, as a parent, felt when I had a new baby (each time). Babies can be a challenge, but they're also amazing, adorable, and so lovable. This book describes all the ways your life changes when there's a baby, in a format that can be easily understood and appreciated by kids. I think this would be perfect for kids who will soon be siblings so they can see that even though life turns a bit crazy with a new baby, it's also wonderful and exciting. It's funny because as soon as I was done reading it, I wanted to read it again. Books like this always get to me and I loved it!